Cooking is much easier and faster now! Being a bachelor, this is perfect cooking appliance. Great buy! 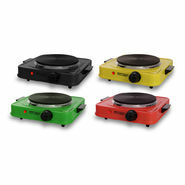 quality is good, great pick if you are looking for portable and compact cooking stove at this price. Go for it. I love cooking my favorite dishes with this product quickly and hassle-free! Happy with the naaptol service. The product is very good I am happy with the naaptol service. "Product was delivered on time and it's workingoking so fine and I loved it U can cook everything in it. " t was my good decision to buy this product. This cooktop is very well made and works nicely as well.